Then as now London was perhaps the greatest city on earth, the centre of trade, finance and empire. Just as in every large city today there are places that aren’t exactly tourist hotspots, back in 1888 Whitechapel was the sort of place even locals wouldn’t go out at night. The area suffered the worst poverty imaginable with dozens of people residing in each building, even in each room. The east end of London was full of sailors and soldiers, the hustle and bustle of the empire with ships coming and going all around the world. Its notoriety was well deserved as only the most desperately poor would live there. Many of the women there had no husbands or family and to meet their measly rent for their doss houses and often their drug and drink addictions too, they would be forced to sell themselves to all manner of dodgy punters. The area was amaze of no go alleyways and narrow lanes which though bustled at night were silent and shady by night. 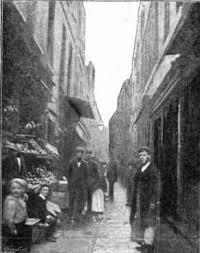 Whitechapel like much of east London at the time was rife with petty and much more serious crime. It was almost a lost cause and the sort of place where one would go to disappear. Many of the population were just passing through, others were newly landed migrants from eastern europe looking for a better life as so many still do today. Despite attempts by the Victorians to improve the welfare of the poor across the country, such moves hadn’t yet reached Whitechapel. 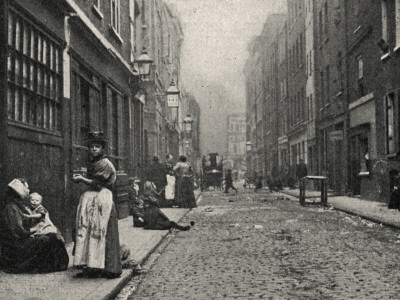 Some of the streets were said to be the most dangerous and murderous streets not just in London but the western world. No wonder then that in August 1888 one of the earliest and to this day the most infamous serial killer appeared in this most crowded of cities to commit the most horrible crimes. Another of Jacks victims was killed by the doorway in the yard against the fence where a neighbour ignored noises thinking it was just a domestic argument. There are 5 canonical murder victims which are generally agreed upon as being the victims of Jack. 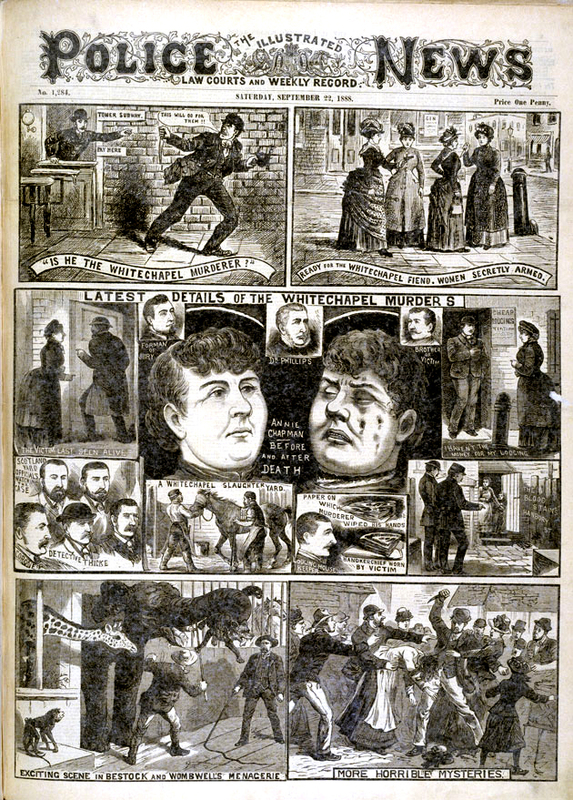 The viciousness of the murders though mean it is unlikely that they were his first or indeed only victims and that other killings labelled as the Whitechapel Murders were his work too, most likely Mary Tabram who was stabbed dozens of times in the dark cobbled streets of Whitechapel just a few weeks earlier. Things really got going on August 31st when the body of Mary Ann Nichol was found at 3.40am in Bucks Row. Her throat had been cut and there were numerous incisions on her abdomen. Just a week later poor Annie Chapman met her end early one morning. She was spotted with a genteel looking though hairy dark man at 5.30am in Hanbury Street. 15 minutes later a neighbour heard a commotion and if he had bothered looking over the fence he might have seen something. As it was Annie Chapman was discovered dead at 6am, her throat had been slit, her body slashed and internal organs removed. Photo taken just a few years after Jack. One of the murders took place by the archway leading off to the right. Whitechapel fell into hysteria and understandably so. Who was the man who could murder women so brutally, dismember them and escape the hundreds of police in just minutes. Ironically most of the citizens kept themselves locked safely indoors once dusk fell. It was the very women who Jack was targeting who remained out. They may have thought they knew better by only seeing familiar clients and faces. Each night they desperately needed to earn a few pennies to avoid being thrown on the street which would have been the end of them even in the best of times in Whitechapel. Police estimated there were 60 brothels and 1200 women working as prostitutes in the radius of just a few streets. Sunday 30th September 1888 was a night that took things to new, despicable heights. Elizabeth Stride was killed with one cut to her artery to her neck but was not mutilated. She had been seen shortly earlier with a man. It seems the killer was interrupted as when the man who discovered the body was riding his horses into the old yard, there was a noise in the far corner and the horses became highly disturbed. It is likely that they sensed Jack hiding in the shadows as he made his escape. Incensed that his killing had been interrupted Jack fled through the maze of alleyways until he met with Catherine Eddowes who shortly before her death was spotted with a man. The police patrols were widespread and intensive and a PC had patrolled Mitre Square as part of his route. Just 14 minutes after he had walked there, he found Catherine Eddowes dead. She had been horribly murdered and mutilated with her intestines flung over her shoulder and other organs removed. In fact she had only been released from a prison cell after collapsing drunk in the street less than an hour earlier. Apart from the obvious shock value and unspeakable actions which elevated the crimes from mere murders, it was mused by many that Jack may be a doctor or butcher? How else could someone commit such crimes so quickly? The final canonical killing was that of Mary Kelly. She was discovered at 10.45am on Friday 9th November. She had been killed in her room. The way she was lying in bed already naked indicated she was already with her killer. She had been horribly mutilated and the extra time Jack had in the private room allowed him to extrapolate his frenzy. The walls were covered in blood and it was said to be the most horrific sight imaginable, more the work of the devil than even a serial killer. Understandably the house was demolished a few decades later. And then the killings stopped as suddenly as they had started, or did they? There were certainly plenty of other murders in Whitechapel over the next few years. Opinion amongst the investigative police was divided over which were the works of Jack. Eventually it seems likely that Jack either fled the area, went overseas, was imprisoned for unrelated crimes or put nto an insane asylum. Even today, new discoveries and insights are being made but whether the identity of Jack The Ripper will ever be agreed upon is unlikely. Many of the original police records were destroyed in The Blitz and decades before that records were literally thrown out on the street when storage became an issue. Some records and testimonies do exist and there was until recently even a piece of clothing belonging to Catherine Eddowes which Jack had dropped whilst fleeing the scene and about to write a message on a wall. The clothing was DNA tested but at the time technology was such that it was unable to identify the killer after a century of contamination by investigators. Modern detectives believe that with just a bit better technology and a better handling of the case that Jack would have been caught. Nevertheless the police interviewed hundreds of suspects and conducted countless door to door inquiries. They had witnesses but not all of their testimonies matched up and there was a societal pressure that led police to believe the killer had to be clearly insane. People of a high social standing were deemed to be above such murders and on one such instance a murder victim being escorted by a well attired gentleman with scarcely concealed bladed instrument was ignored by a police patrol. The police also wilfully destroyed a graffiti message most likely left by Jack on a brick wall immediately after a murder. It was decided that waiting for daylight for a full investigation to be made and the arrival of the new fangled science of photography would risk causing race-riots due to the anti-Semitic nature of the writing and so the whole wall was washed down and all evidence eradicated with it. There are disagreements over its meaning but as it was found with a piece of Catherine Eddowes apron it had adds an interesting twist. Was Jack claiming himself to be Jewish or was he trying to throw the police off his scent? A few months earlier a Jewish suspect of a murder in a nearby street had pushed race-relations on edge so it is understandable why the police felt they had to remove the writing before uninformed rumours spread like wild-fire. 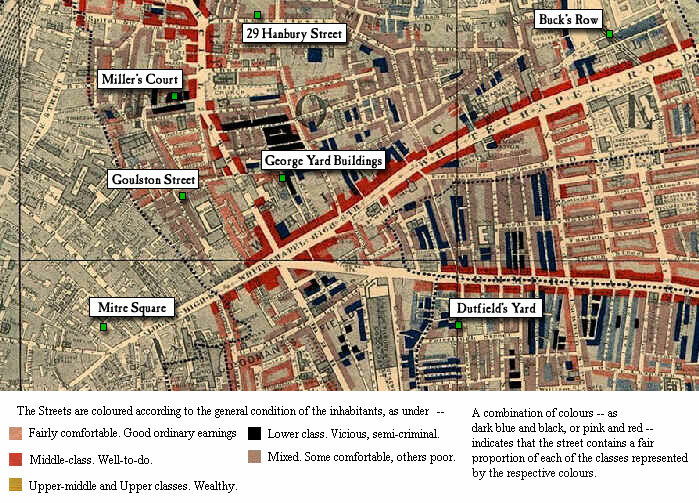 Charles Booth’s Map of London Poverty, 1889 from the Casebook website. Notice how close the murders canonical murders are and how they are in the poorest areas. It is likely that Jack The Ripper lived in Flower and Dean street which is located right in the centre of the killings and within just 200 yards of the homes of the women and not much further from the murder locations. 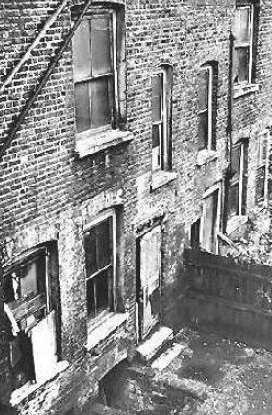 The street itself was destroyed in WW2 bombing and many but not all of the surrounding slums were too or were otherwise torn down by either Victorian reformers or the later developments of the 1960s-90s. Jack The Ripper is about the first serial killer with his own nom de plume which appeared when Jack wrote a bloody letter or possibly it was the work of an ambitious newspaper reporter. 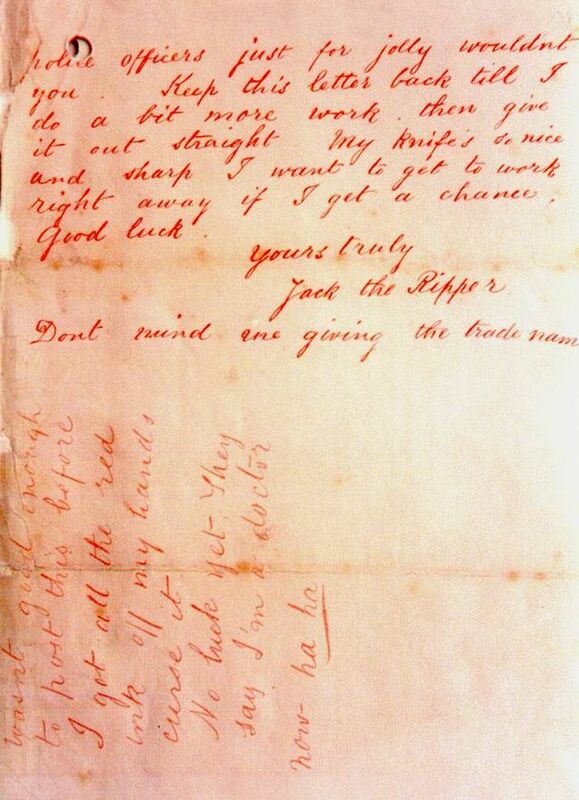 This letter was originally thought to be a hoax but it mentions how Jack will cut off part of his next victims ear. 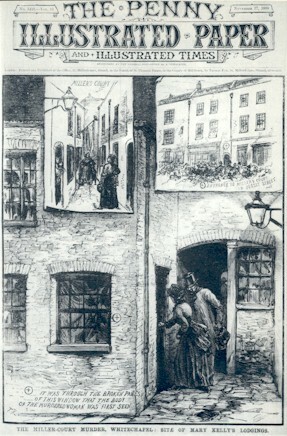 Soon after Catherine Eddowes was found with her ear lobe removed. 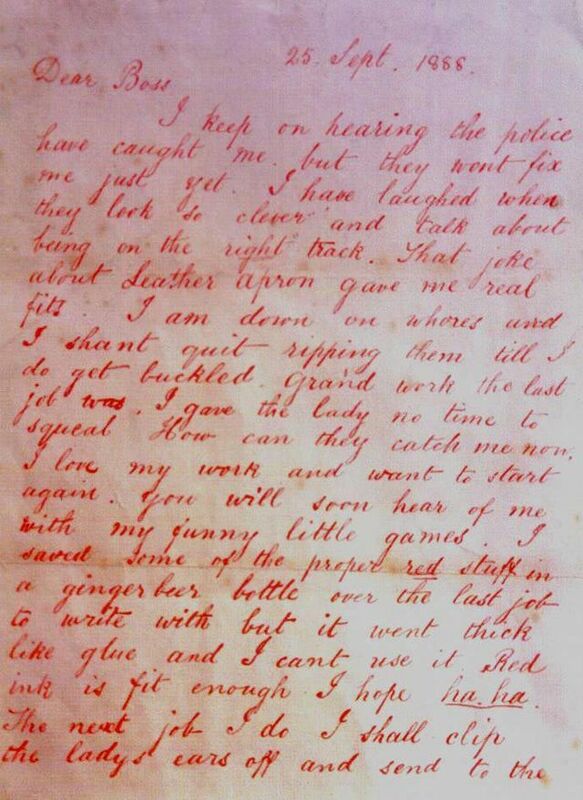 Page 2 of the dear boss letter posted on 27th September 1888. 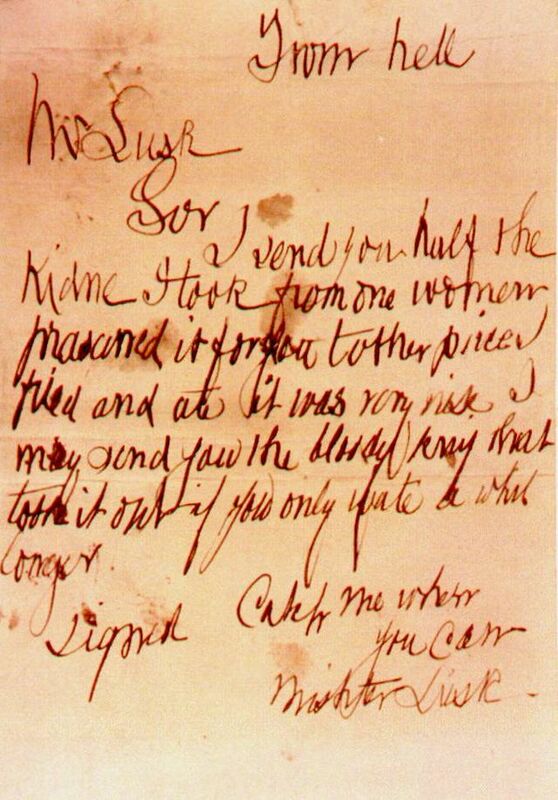 There were several other letters such as the one known as “saucy Jack” but the most famous has to be the From Hell Letter. This was sent in a wooden box to the George Lusk, the head of the Whitechapel Vigilance Committee. Inside was a letter and half a human kidney. Police thought it was a hoax but experts later tested the kidney and they determined it belonged to a 45 year old woman with health problems caused by over consumption of alcohol. Catherine Eddowes had had her kidney removed, she was 46 and was known to suffer from a severe drinking problem. The work of a sick and twisted mind. I send you half the Kidne I took from one women prasarved it for you tother piece I fried and ate it was very nise. I may send you the bloody knif that took it out if you only wate a whil longer. Despite the biggest manhunt in history and the fact that London lived in sheer terror for months if not indeed for a year or two, without any statements from victims, no photographs of the suspect and modern investigative sciences in their infancy Jack The Ripper was never caught and his identity remains a mystery. A few more viscous murders continued carrying many if not all of his hallmarks. Francis Cole was killed (see one of the photos below) but when found by a policeman was still able to open her eyes. Police procedures meant the officer was duty bound to stay with a living victim and had to ignore the fleeing heavy footsteps of Jack running away as quickly as he could. The list of possible suspects is impressive and includes locals, passing sailors, doctors, the criminally. insane and even a member of the Royal Family One of the more likely suspects is that of the American, H.H. Holmes. He was in London at the time of the killings and his defence lawyer believed him to be Jack before he was executed in New York a decade later on the count of 27 other murders. One or two people have said to have confessed to be Jack whilst others have fraudulently claimed to be Jack or know his real identity. 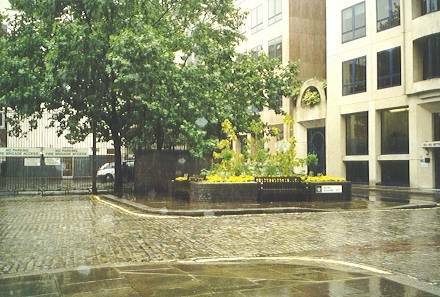 Modern detectives believe that Flower and Dean Street is the most likely place for Jack to have lived. It is central to the area, murderers tend to kill near to home and he clearly knew the dark maze of alleyways in Whitechapel. 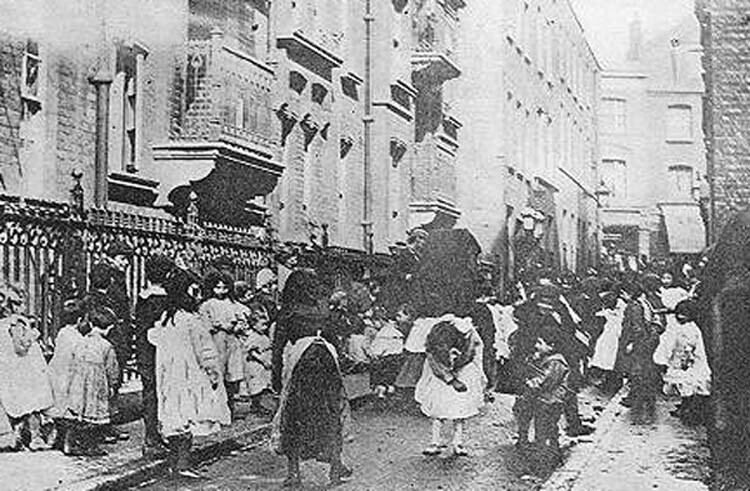 Whitechapel has changed beyond all recognition in the last 135 years though parts of it would never be described as affluent. Many of the pubs and churches remain as do even some of the buildings from the time along with some of the narrow passage ways and cobble-stoned squares that Jack and his unfortunate victims lived and died on. 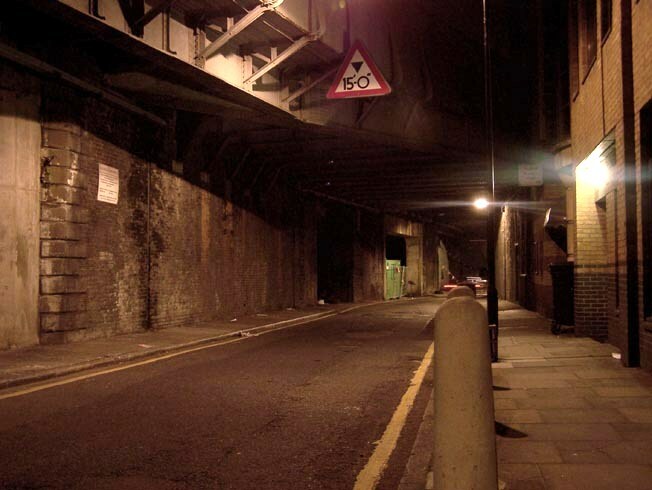 Whilst it is in no way comparable to how it used to be, there are still several areas related to the Whitechapel murders that no one would want to go at night. Photo of Chamber Stree by John Bennett. Imagine walking down here at 1am with only oil or gas lighting… perhaps none at all knowing that Jack could be lurking in the shadows. Frances Cole met a grisly end here on 13th February 1891. I think we would all be looking over our shoulders in broad day light even in 2014. Atmospheric photo from Jonno on Casebook.org. Catherine was murdered on the pavement to the left of the flower box, under the tree. As horrific as the 11 Whitechapel killings were they did at least help bring recognition to the terrible conditions of the poor in east London and Whitechapel in particular and provided momentum for change. Police began to develop much more modern ways of dealing with murders, they even developed the first trainers/sneakers as it was thought their boots made too much noise on the London cobble-stones at night. The famous British press sold millions of papers off the crimes which went some way to creating the modern “cut-throat” tabloid culture in Britain. 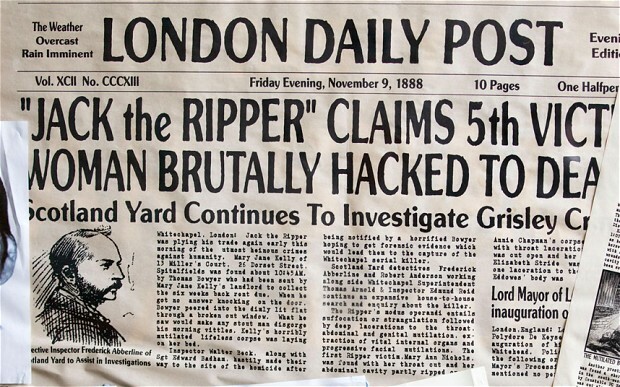 Jack The Ripper makes headline news around the world. 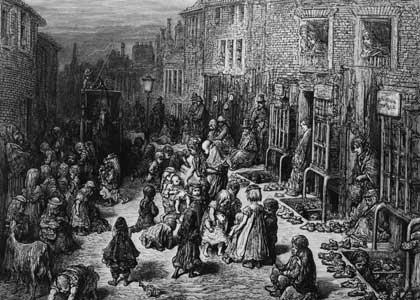 Tabloid papers did much to hype up the all ready hysterical and helpless poor of London. Revolutions in printing cheap papers helped created the tabloid paper. Drawings were used to increase sales to the poor with low levels of literacy. Though there have been a few British serial killers who have killed more, most were not so gruesome and they were all identified in the end. 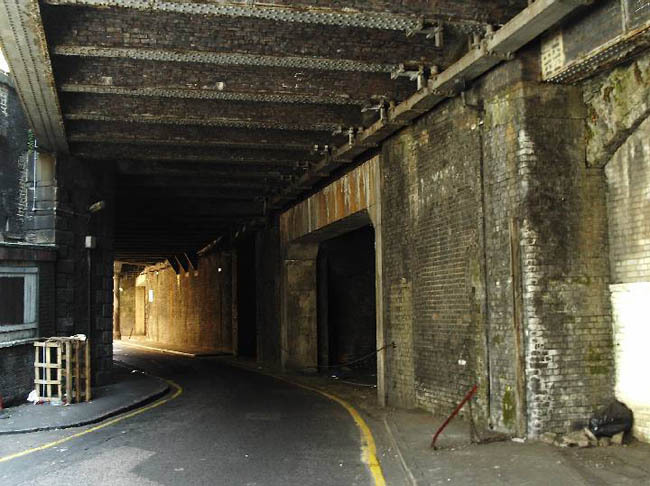 Jack The Ripper remains a mystery who kept London on edge over a century ago and whose presence along with that of his poor victims can still raise the hairs on the back of your neck in certain parts of Whitechapel. Whoever he is, he thoroughly deserves the much voted title of the worst Briton of all time. I will shortly start offering day-time walking tours on Jack The Ripper through my Ye Olde England Tours company. Join me, if you dare! This entry was posted in history, London, Ye Olde England Tours and tagged Annie Chapman, Catherine Eddowes, Elizabeth Stride, history, Jack The Ripper, Life, London, Mary Ann Nichols, Mary Jane Kelly, Murders, Serial killer, Travel, Whitechapel. Bookmark the permalink. Hi Stephen, great article. We did a Jack the Ripper daytime walking tour with you back in December which was very informative and enjoyable. Thanks for taking us back in time!